Derry City's Simon Madden and Patrick McEleney pictured after the club's penalty shootout defeat in the Setanta Cup Final. DERRY CITY’s chairman, Philip O’Doherty believes there’s a ‘huge demand’ for a cross-border football competition in Ireland and says he would welcome a return of the Setanta Cup. The competition, which featured clubs from the Irish League and League of Ireland, hasn’t been played since 2014 when Sligo Rovers lifted the trophy. Derry's Rory Patterson gets a late opener at the Oval in Belfast during the 2012 Setanta Cup Final. Derry’s memorable 3-1 win over Linfield at Brandywell in 2012 brought with it the biggest gate receipts the club received since Mr O’Doherty took over as Chairman in December 2009. And while there has been muted calls for its resurrection from certain quarters, Mr O’Doherty insists he would be delighted to see its return. “The FAI haven’t said anything to us yet about it but I would be delighted to see the Setanta Cup back,” said the Chairman. “It was a fabulous way of bench-marking the League of Ireland and Irish League. “At the time we beat Linfield at the Brandywell, none of us will forget that night, that was our largest attendance since I’ve been chairman of the football club, so there is a huge demand for it. Derry City players applaud the travelling support at Windsor Park. 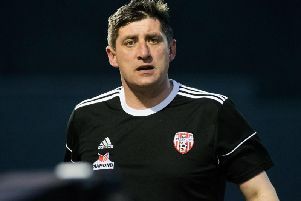 Derry City boss, Declan Devine guided the club to the final back in 2012 when losing on penalties against Crusaders at the Oval and he admits it’s something which still frustrates him.